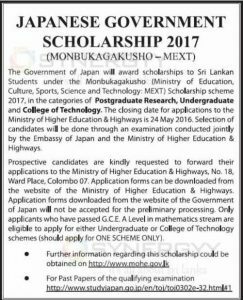 The Government of Japan will award scholarships to Sri Lankan Students under the Monbukagakusho (Ministry of Education, Culture, Sports, Science and Technology: MEXT) Scholarship scheme 2017, in the categories of Postgraduate Research, Undergraduate and College of Technology. The closing date for applications to the Ministry of Higher Education & Highways is 24th May 2016. Selection of candidates will be done through an examination conducted jointly by the Embassy of Japan and the Ministry of Higher Education & Highways. Prospective candidates are kindly requested to forward their applications to the Ministry of Higher Education & Highways, No. 18, Ward Place, Colombo 07. Application forms can be downloaded from the website of the Ministry of Higher Education & Highways. Application forms downloaded from the website of the Government of Japan will not be accepted for the preliminary processing. Only applicants who have passed G.C.E. A Level in mathematics stream are eligible to apply for either Undergraduate or College of Technology schemes (should apply for ONE SCHEME ONLY).